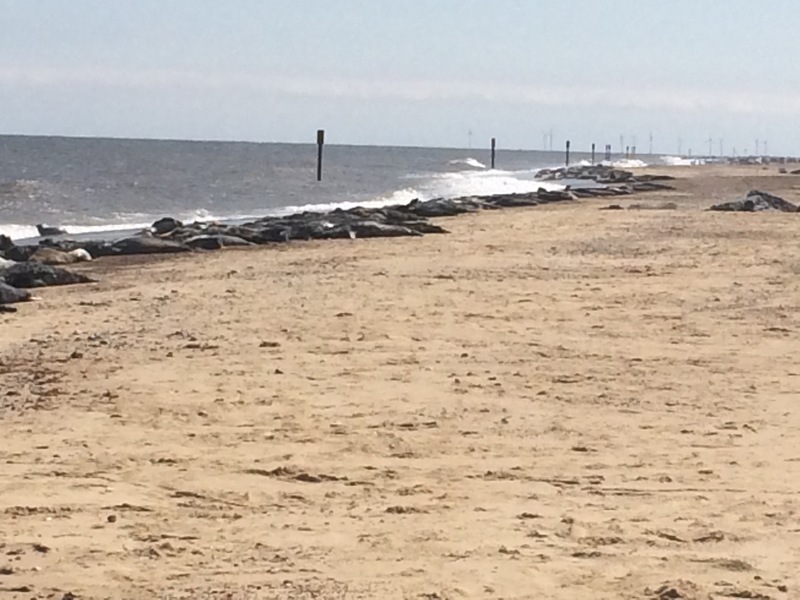 Best view – walking from Dunwich to Southwold and coming out of the woods to views of the sun glinting off the meres on either side of the path to the sea. 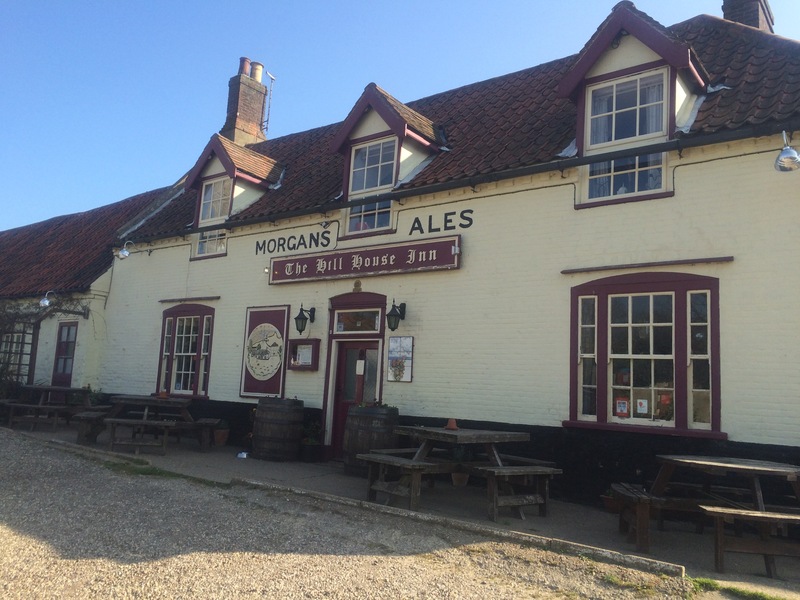 Quirkiest place – The Hill House Inn, Happisburgh. Prettiest Town – Cley-Next-The-Sea with its beautiful windmill located on a hill at the edge of the marshes. 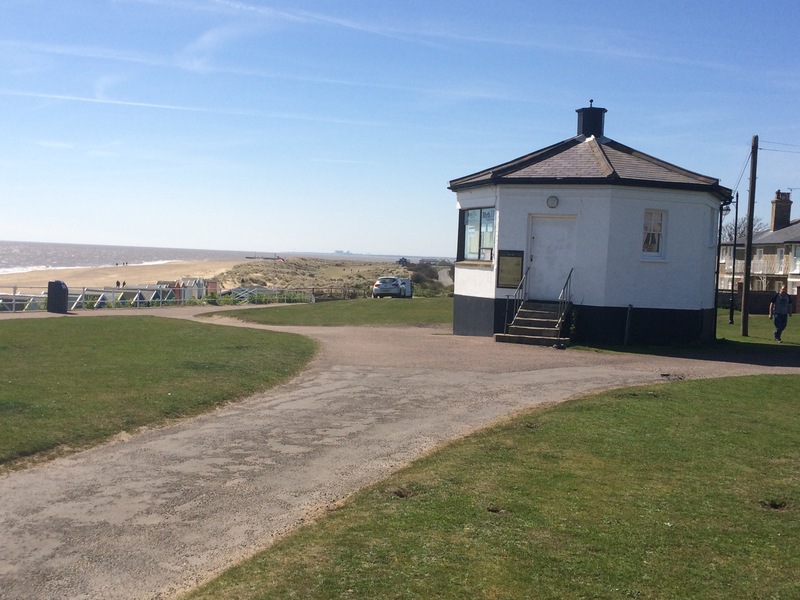 Best campsite – Burnham Deepdale was clean, friendly and well located. 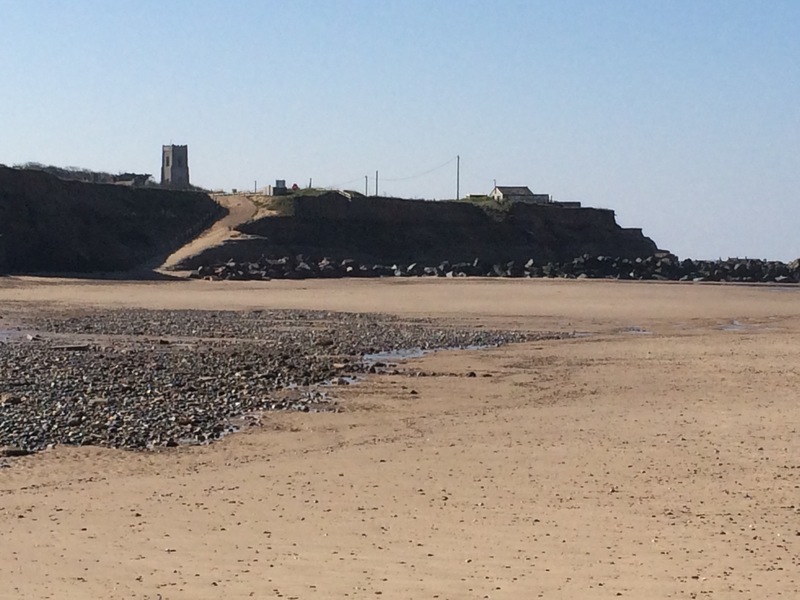 Accommodation in Norfolk is hard to find – I struggled to find campsites on the coast that will take a tent (static caravans rule) and guest houses are busy, even on weekdays in April. 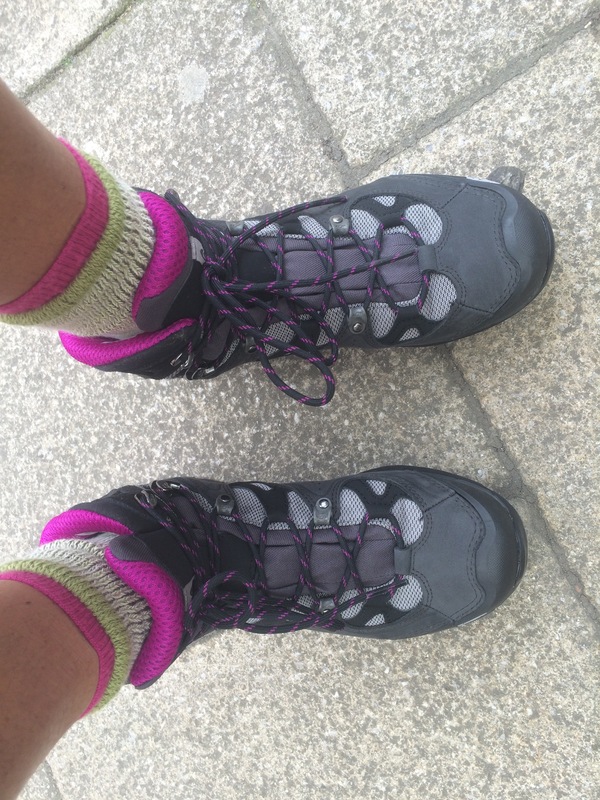 Despite a detour midweek to buy new boots I still averaged 15 miles a day. The new boots seemed to instantly solve my foot problems and the detour to Norwich gave me a good view of the Norfolk Broads. The Broads reminded me of Holland; flat with lots of water channels and windmills (I didn’t see any tulips or clogs). It was a fairly solitary week so it was extra nice to meet Chris’s Aunt Mary for a proper chat. A stunning week with some big highlights. Breakfast wasn’t served until 8 am by the old lady (who is 80). 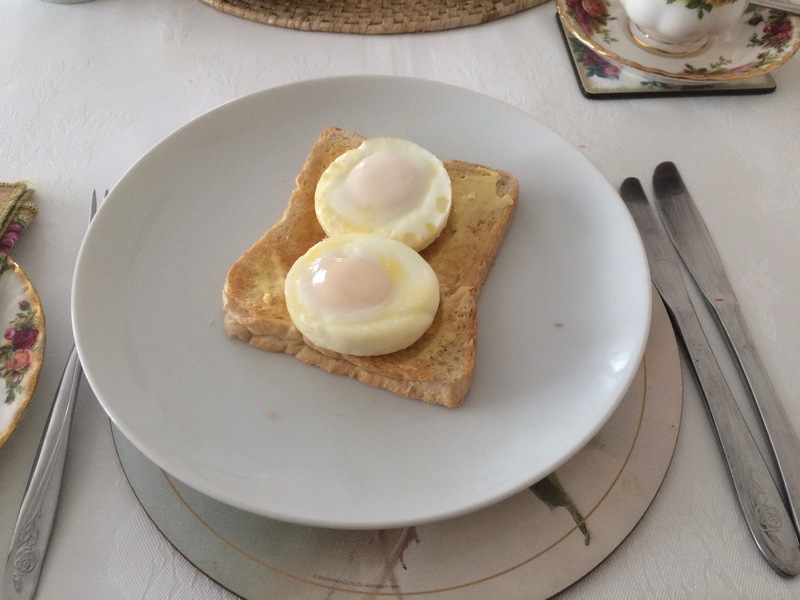 From the limited menu I chose poached eggs on toast. Mistake. It’s like going back in time to the 70s. Still, the old lady was nice and she’s been running the B&B for 40 years (I don’t think she’s changed anything). She told me not to come to Wells in the summer as it’s too crowded. I think I’ll take her advice. The miniature train wasn’t running so I walked the kilometre down to the beach, and what a beach. 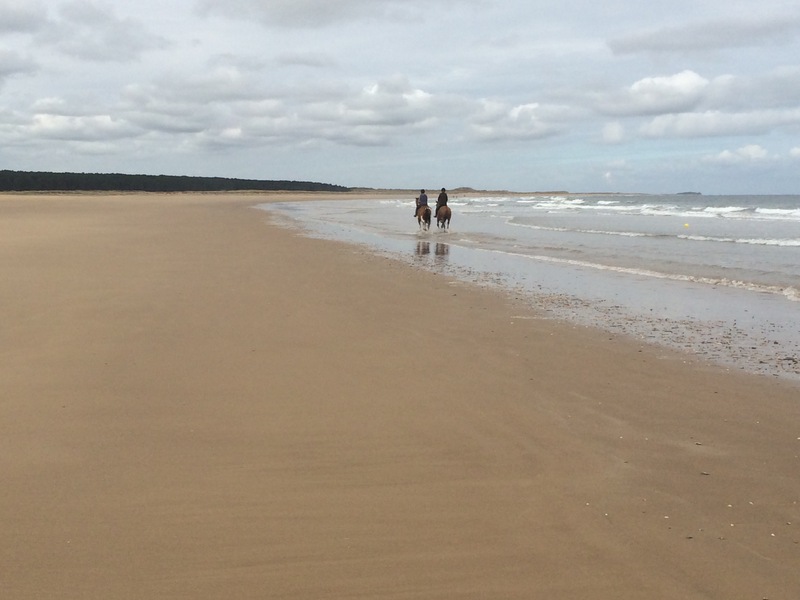 Holkham beach is famous for its vast expanse of sand, used by the Cavalry who bring their horses on holiday here. 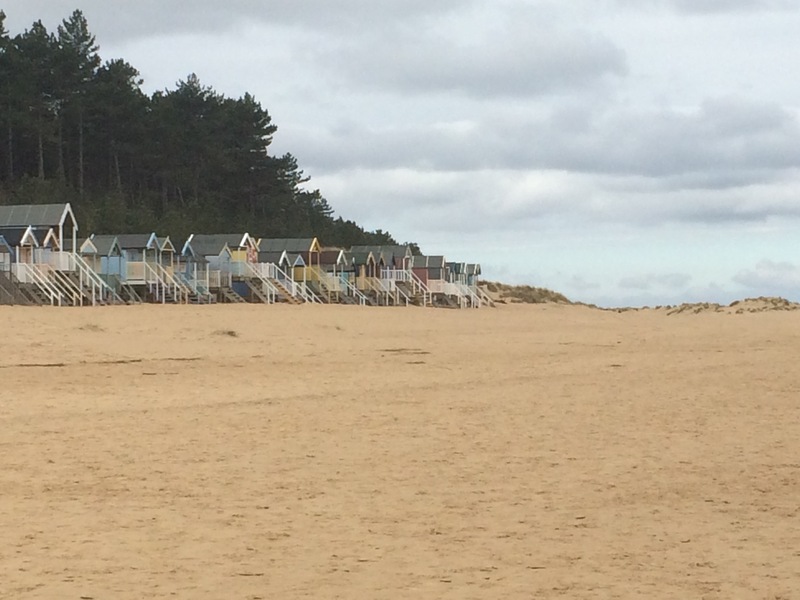 The beach is sheltered from Westerly winds by a pine forest, there are old fashioned beach huts and then there is nothing but beautiful sand and sea. I watched some horses canter down the beach and then followed them down through the gap leading to Holkham Park and Hall. 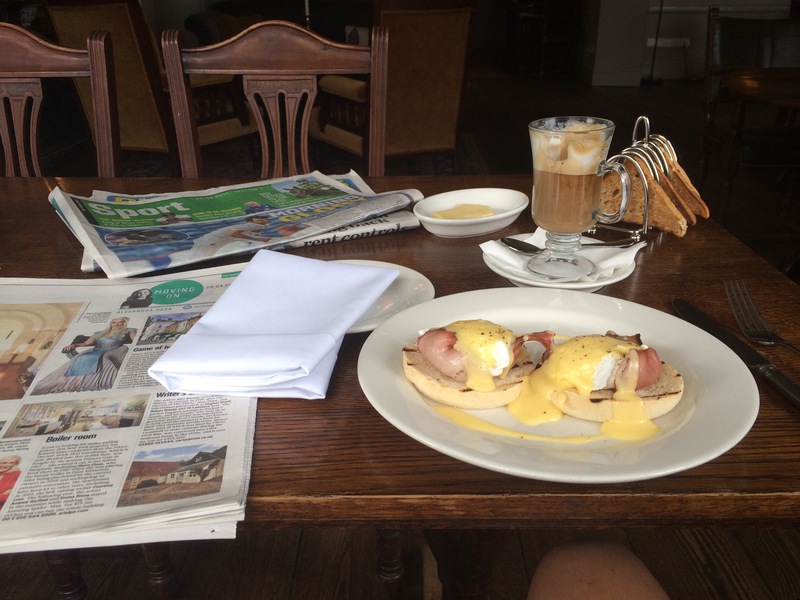 I decided to see if I could improve on my first breakfast with a stop at The Victoria, the inn owned by The Earl of Leicester’s estate. It was an improvement. 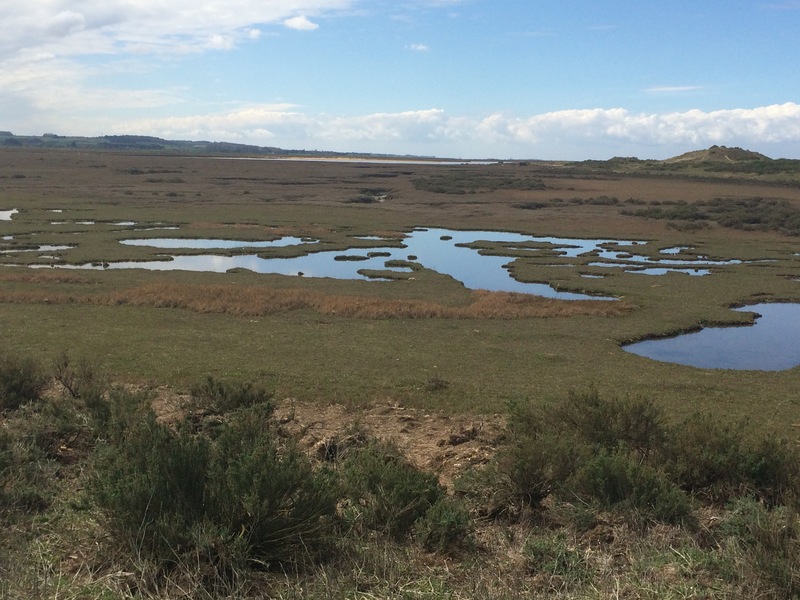 I retraced my steps back to Holkham beach and continued along and then around the corner into Overy Marshes. There were no people here, just the birds to keep me company. I heard a bittern booming from within the reeds, and was serenaded by the constant wireless tuning sound of the lapwings. At one point the marshes reminded me of the giant weather map that GMTV used to have (anyone who was a student in the 90s would know about this). GMTV weather map of the Highlands? After about 5 miles of walking alongside the marshes and the creek I arrived at Burnham Deepdale backpackers campsite about half an hour after the sun came out. I have become an expert at pitching my tent and then washing and drying my walking clothes before heading to the nearest pub complete with puffy jacket and flip flops. Good job I don’t care what I look like! 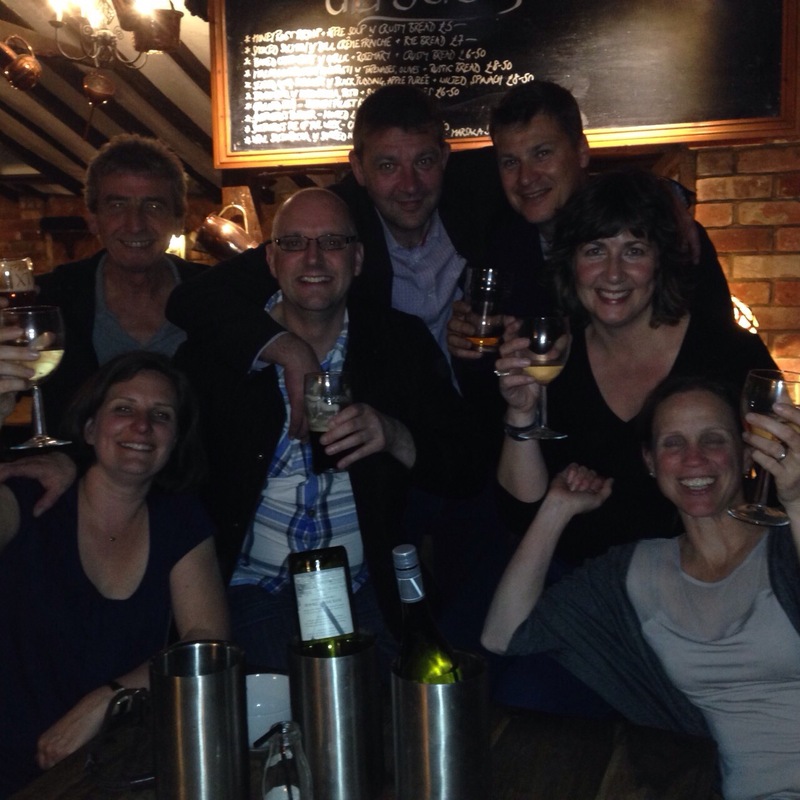 Thanks Spike for the recommendation of the Jolly Sailor. It does good beer and pizzas. Thank goodness there is a tescos in Sheringham as I needed to replenish my snack stocks. I had a nice walk over the cliffs to start, through the gorse bushes in full bloom and past the golf course to Sherbourne. Here I walked up the lane from the beach to meet Chris’ Aunt Mary who owns Millstream House B&B. Mary fed me coffee, fruit and cake and we had a good chat – something I miss a little bit being on my own. After an hour and a half I was quite behind in my walking until Mary offered me a lift up the road to Salthouse so that I didn’t have to walk too far on the shingle beach. Time for another piece of coconut and lime cake then, excellent. After the shingle beach came Cley marshes, which are mostly freshwater and alongside the River Glaven. Another nature reserve and the birders were out in force. At Cley Eye you have to walk inland from the beach, across the marshes, to the very pretty Cley-next-the-Sea in order to get a bridge across the river and come back down the other side. 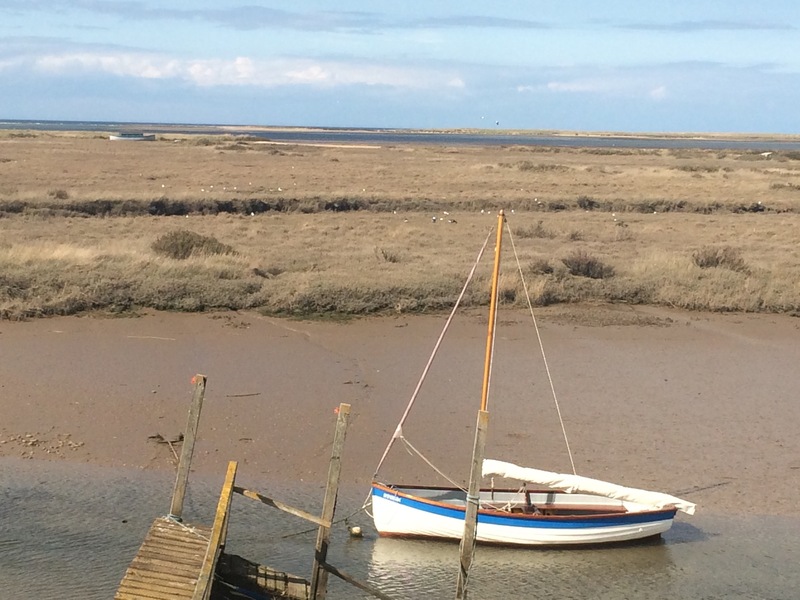 From Cley Eye you can walk to Blakeney point, at the tip of a big spit of sand and another breeding site for sandwich- and little- terns. I didn’t have the time or the energy for the extra 4 miles today. As you look across the flat marshes from the beach there are 2 small hills (little bumps really) with houses on them; one is Cley and the other is Blakeney. 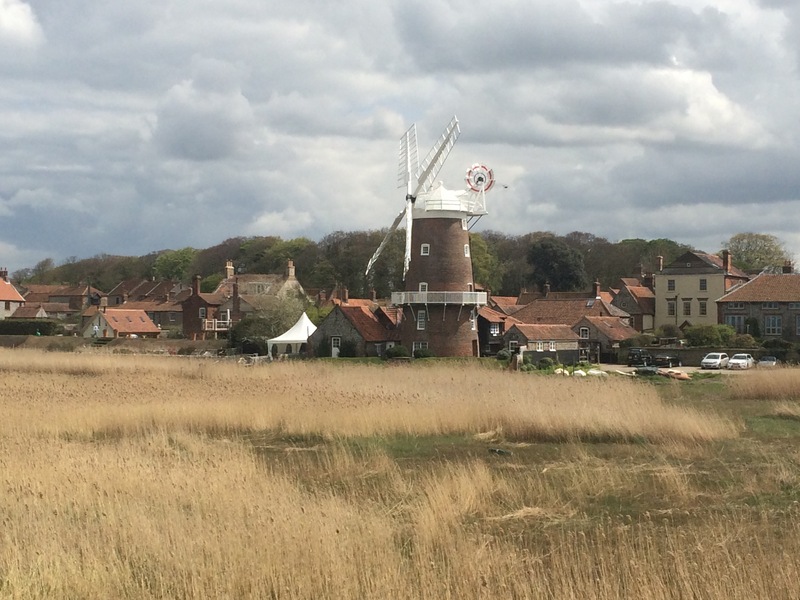 Cley has a beautiful windmill and Blakeney has a church poking out of the trees on top of the hill. From Blakeney the rest of the walk was all alongside salt marshes. I passed lots of people, but the Saturday afternoon strollers are not as friendly and so not many even said hello. On the wildlife front I was treated to a good view of a pair of marsh harriers and at one point a hare ran out in front of me, I startled it, and it turned tail and ran away. Arriving at Wells-next-the-Sea the clouds seemed to be getting darker and more threatening, and the wind was picking up so I was glad to arrive at my B&B. I struggled to find accommodation in Wells so had to make do with an over-priced and rather dirty room in an old lady’s house. Still, I could be camping (if I could find any campsites). The local pub was full and served decent food so I spent my usual evening trying to plan ahead. Not quite the same as an evening in my local at home. Look what I’m missing in my local pub at home! It was a later start today than I intended as I got talking to the pub landlord at breakfast, and he can talk. He used to be an aircraft engineer for Hawker Siddeley; a proper engineer (Gareth I can introduce you if you want?). He now owns The Hill House Inn. I looked in on the barman making beer (The DancingMenBrewery is in residence) in preparation for the annual Solstice Beer Festival to be held18-22 June. If anyone’s in the area give it a go. Another sunny day and I was sure to put lots of suncream on as I burnt yesterday. I walked a couple of miles on the cliff top before I had to hit the beach in order to get around the enormous gas distribution centre at Bacton. Apparently 60% of our gas comes into the UK here, this I gleaned in the pub last night. 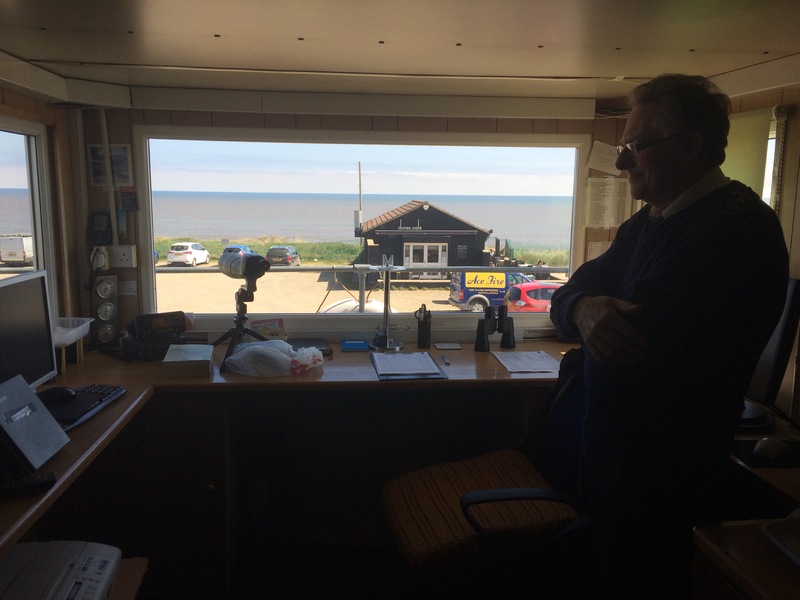 I popped into the Mundesley Coastwatch hut to check that I could get all the way to the next town along the beach and I can only say that the Coastwatch man didn’t know his coast! 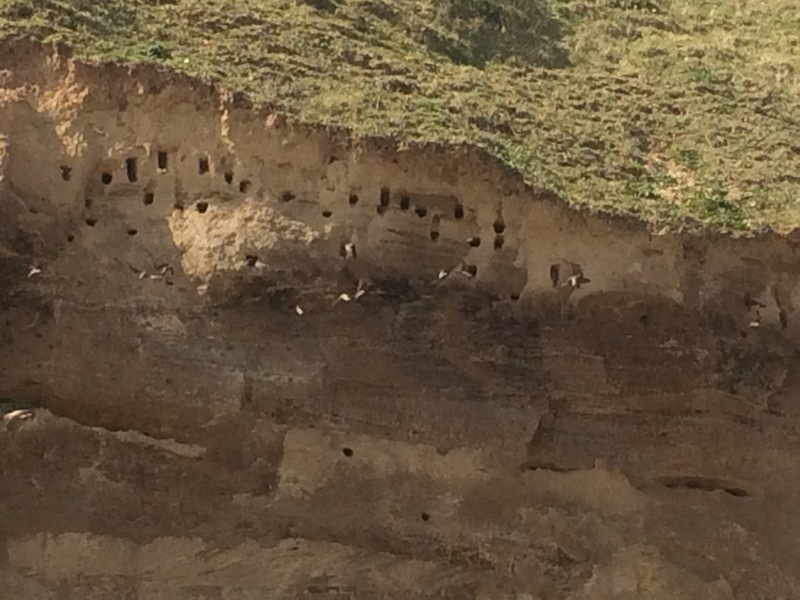 Walking the beach was hard work as it was near high tide but I did see lots of sand martins nesting in the eroding cliffs and watched a fisherman land a sea hound (looks like a small shark). 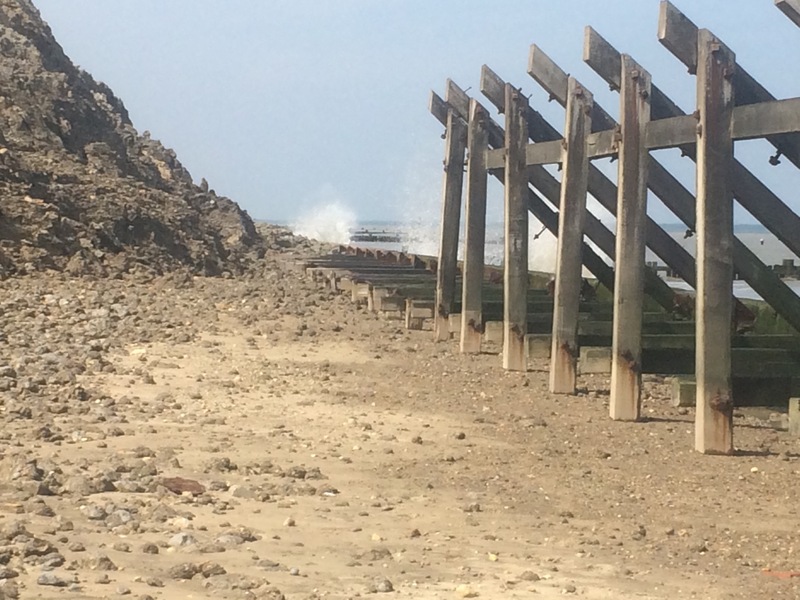 After about 3 miles I reached an impass, where the fallen cliffs had obstructed the beach and the sea was still crashing against the protective groynes. Here I met Kristina, a quantity surveyor, originally from Germany but now resident in London, on holiday in Norfolk and also waiting for the ride to recede. We were stuck for almost an hour before we felt able to run along the barrier wall without getting too wet. It was a relief to get off the beach at Overstrand as I was starving by then. Fortunately the Cliff Top Cafe came to my rescue and I was able to refuel and enjoy the magnificent view out to sea. Apparently from the cafe to Tower Bridge by sea is 178 miles (it’s a lot further if you take the coastal route!). 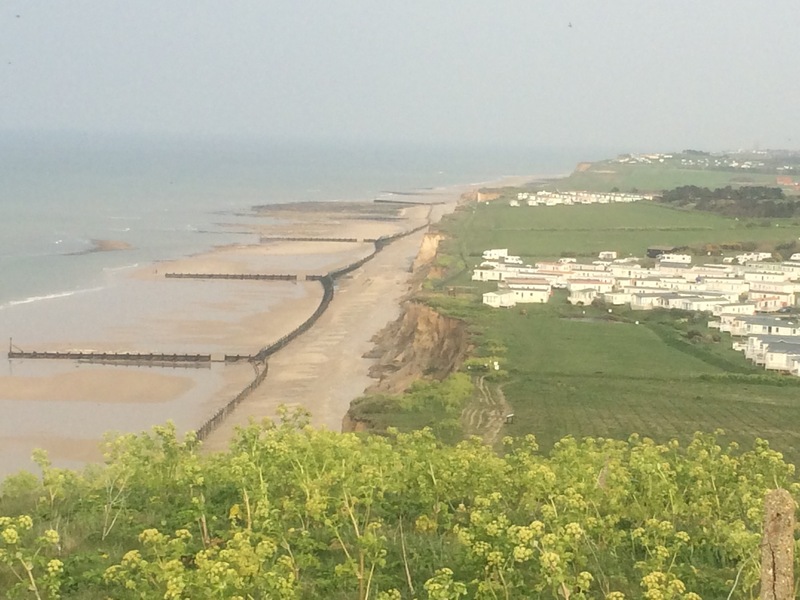 Two miles over the cliffs and through the Royal Cromer Golf Course to Cromer and the obligatory crab sandwich. Suddenly the visibility deteriorated a bit, it almost went misty and the sun disappeared; I don’t know where because clouds didn’t roll in. It was almost like someone turned the dimmer switch and the sky went from sunny and blue to grey. Very strange. 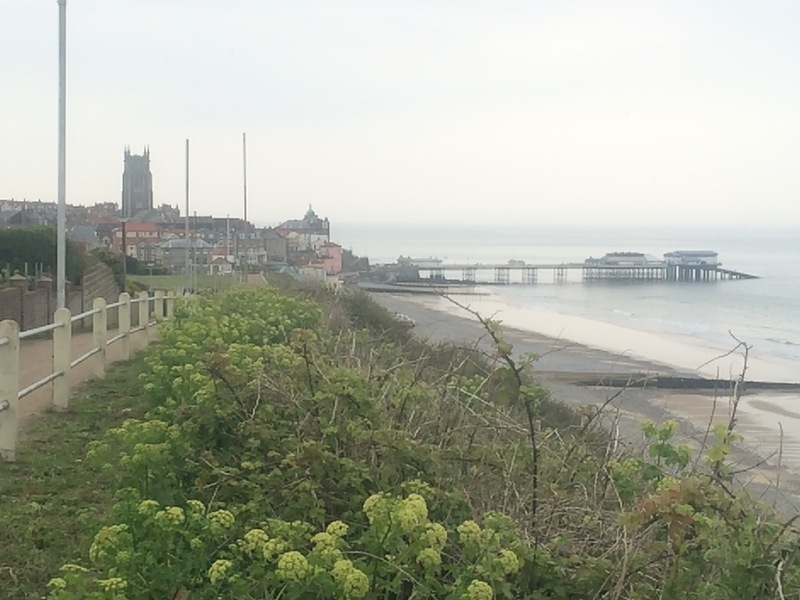 Cromer appeared like a typically pretty seaside town. As if to emphasise the fact I noticed the sea no longer looked brown but had changed to blue and looked very clear from the cliff top. I ate my crab sandwich and then pressed on to Sheringham, once more on the beach but by now the tide was out and walking on the wet sand was lovely. I passed Cromer pier, winner of pier of the year 2015. For the final couple of miles I was able to get onto the cliff top again and experienced my first hill of the trip, Beeston Hill. It’s a whole 65m above the shore but affords great views of the area and was the site of a WW2 Y Station (phonetic abbreviation for Wireless Intercept Station). A night in Sheringham YH awaited and a chance to do some laundry. Thanks to Sally for sending me a link to this BBC news article. 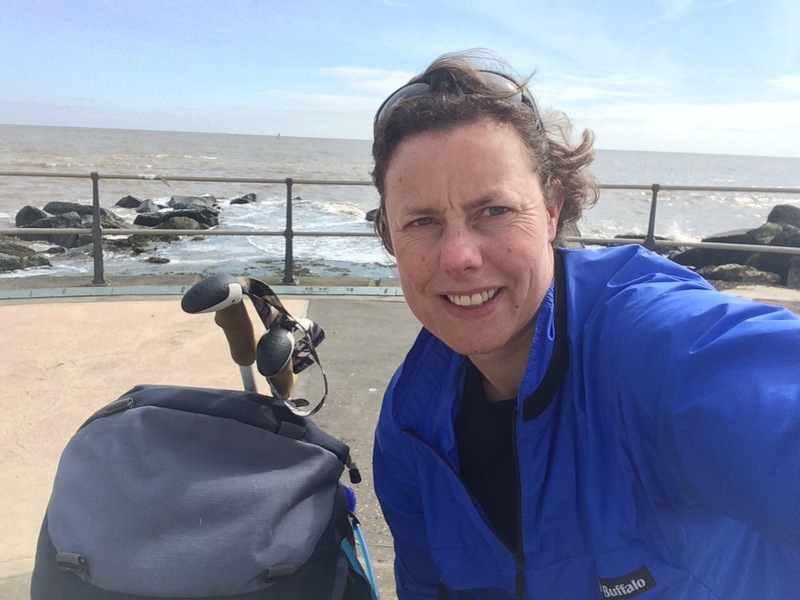 I walked through Jaywick on day 10 and wrote that it was the most poverty stricken place I’d seen. Having watched the BBC video I think they must have trawled the town to find these people; they seem a lot more sober than everyone I met! 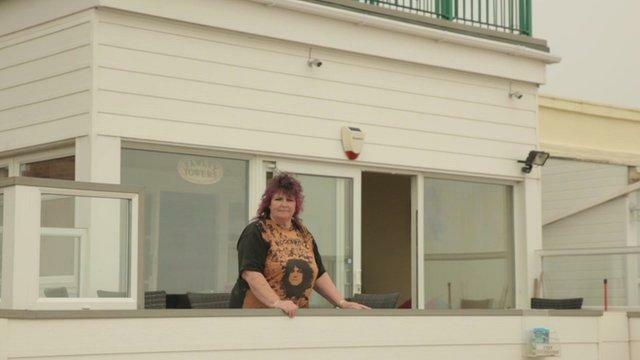 Jaywick was named most deprived place in England in 2010. It lies in the first constituency to elect a UKIP MP. What a day. Oh happy feet in new boots. I spent the whole day walking on the beach or in the dunes (so I probably actually walked at least a mile further than stated) and it was lovely; the sound of the sea accompanied me all day. The further into Norfolk I got, the finer the sand and the fewer the stones on the beach. Still very few people though, mainly dog walkers, and it is noticeable as walking through the dunes one has to pick ones way past the dog poo! The day started cloudy with not a breath of wind, so the turbines out in Scroby Sands Wind Farm were still; however, by 11 am the sun was coming out and it turned into another gloriously sunny afternoon. I am so tanned that I am concerned by the end of this trip I’ll be 40 but look 50. People might think my mother is my sister (Norfolk joke…my apologies to anyone from Norfolk). I reached Winterton-On-Sea in time for a late morning coffee and a quick visit to the Winterton Coastwatch tower. It’s manned by volunteers who record passing shipping for the Coastguard. To do this job you need to be happy spending hours watching the sea and drinking tea. Winterton looked like a nice place, with some quirky housing, including a lighthouse and some round houses. 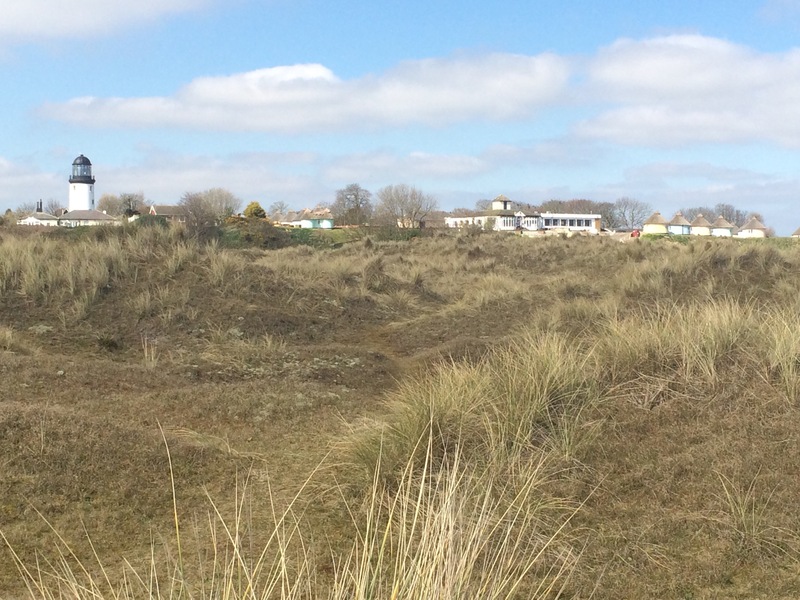 Fancy living here in Winterton-On-Sea? The afternoon walk from Winterton was one of those magical times that I hoped for on this trip. I began wending my way through the dunes, eyes peeled looking for adders, but I wasn’t lucky enough to see one even though it was really warm, still and great basking conditions. I did see a pair of ring ouzels but gave up on seeing an added and decided to pop over the dunes and down onto the beach. As I came over the dunes I noticed a line over large stones on the shoreline, but hang on a minute, they were moving. 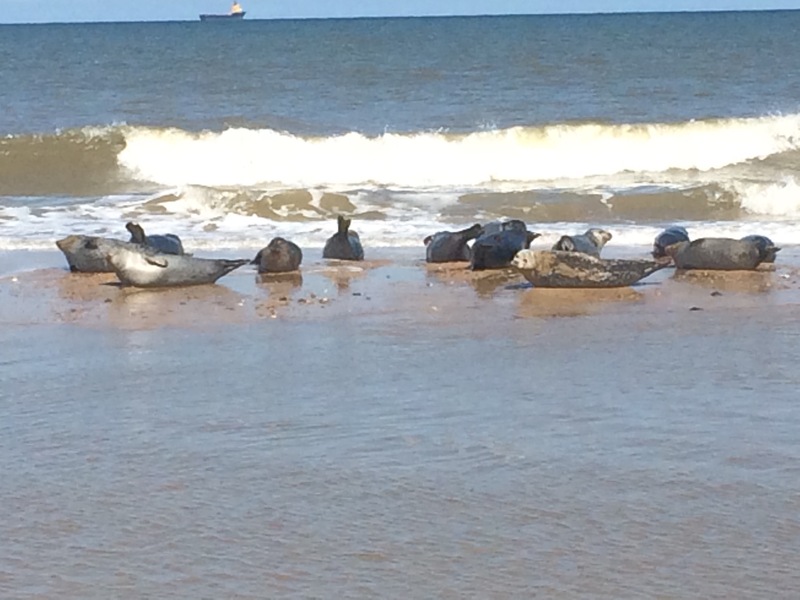 It was a line of grey seals, about 400 of them, lying on the beach enjoying the sunshine. I couldn’t believe it. I walked along the beach, keeping a respectful distance of about 20m and got a great view of them at rest and at play in the surf. 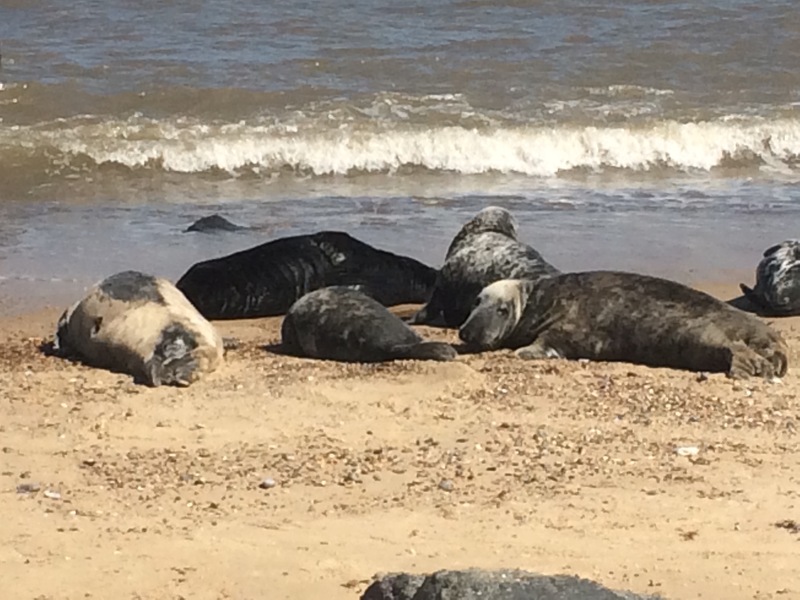 For anyone that’s not David Attenborough or hasn’t been to Horsey before, seals are smelly. A very long line of basking seals, maybe 400? About 15 minutes further on there was a car park and signs pointing the way to the Horsey seal colony; how lucky I decided to walk on the beach when I did! There were more seals further on up the beach, this time common seals, which are shorter, fatter, cuter looking and lift their tails up whenever a wave comes as if they don’t want to get wet. After that experience I was on a high so decided to try my luck again adder-spotting; they must be actively avoiding me. 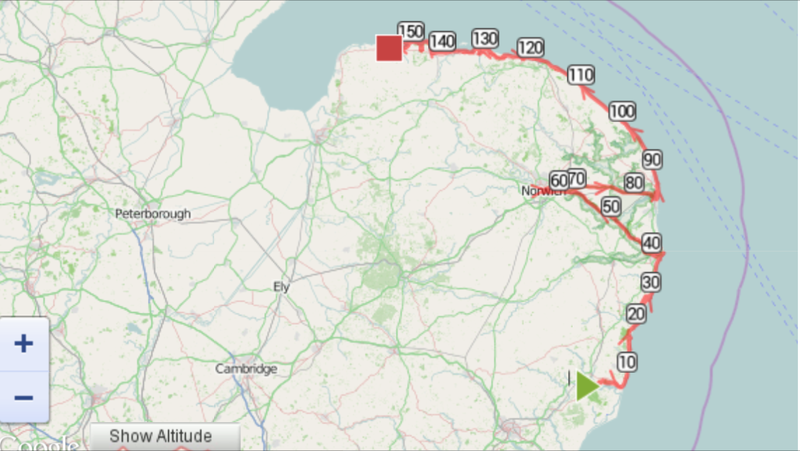 I had a quick stop in Sea Palling for a cup of tea and a sandwich and then it was the last section to Happisburgh. I was lucky enough to see a pair of Little Terns to round off a good day. Since I arrived in Suffolk several beaches have had sections roped off because Little Terns nest there, but I am a bit too early so I was fortunate to see a pair flying low over the shoreline. Approaching Happisburgh the cliff erosion becomes very apparent and this village is famous for shrinking since the 1990s as houses have fallen off the cliff. The beach section here is closed because of the danger. I didn’t need to walk it however as I was staying in a quirky pub and treated myself to Cromer crab and chips for dinner. What a fantastic day. It was much colder during the night than it has been but luckily my jacket makes an extra blanket inside my sleeping bag and I was ok. I had some tent neighbours and I heard them get up and drive off in the car. Everything was wet this morning and drying out the soaked tent was more difficult without the sunshine I have become accustomed to. I am finding myself spending more time in campsite toilet blocks than ever before – they all have hand driers where I spend what seems like hours drying clothes and my tent. I had a 3 mile walk along the beach to Lowestoft; a blustery walk along a shingle and sandy beach with lots of tufts of maram grass. The erosion of the cliffs is quite prevalent here. I walked along the deserted sea front at Lowestoft, rather different to my experiences at Southend and Clacton. Past the harbour was the industrial part; clearly a town built on the fishing and marine industries. 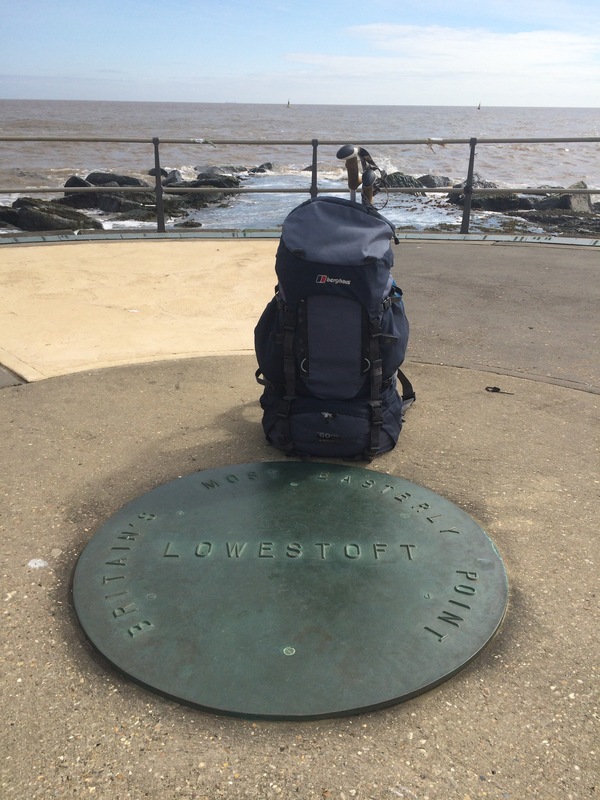 My target was Lowestoft Ness, the most Easterly point of the British Isles, on the outskirts of an industrial estate but handily marked by a huge wind turbine and something called a Euroscope (a concrete compass with distances to random places in Europe – John O’Groats is 465 miles). After the excitement of Lowestoft Ness I caught the train inland to Norwich to buy some new, lightweight, softer boots in the hope that I can finally sort out my foot problems. Hard earned experience from the last 2 weeks convinces me that there’s too much walking on roads and concrete for me to wear hard boots. Shopping done I caught the bus to Great Yarmouth and my first night in Norfolk. The best thing about today was that although I missed out a bit of the coast I did get to see the famous Norfolk Broads. The train from Lowestoft followed the River Waveney marshes and on the bus journey to Great Yarmouth, like an excitable child, I sat in the front seat on the top deck of the bus and was rewarded with a great view of The Broads. Definitely not a wasted day. Another beautiful sunny day; if only this weather could go on all year. I managed an early start and headed for the small village of Dunwich, which is famous for most of the town now being under the sea. It has a beautiful relic of a 15th Century Friary. I spent most of the morning walking through woodland with views across the marshes, which was really very pleasant. The walk between Dunwich and Southwold, via the somewhat inland coastal path as far as Walberswick, is well worth the effort. I rewarded myself with a late breakfast at the Walberswick tea rooms. As I sat in the sunshine eating a sausage bap and contemplating the wonderful scenery I reminded myself that I need to think of this morning when I’m cold, wet, hungry, have nowhere to stay etc as this is one of the really good moments. 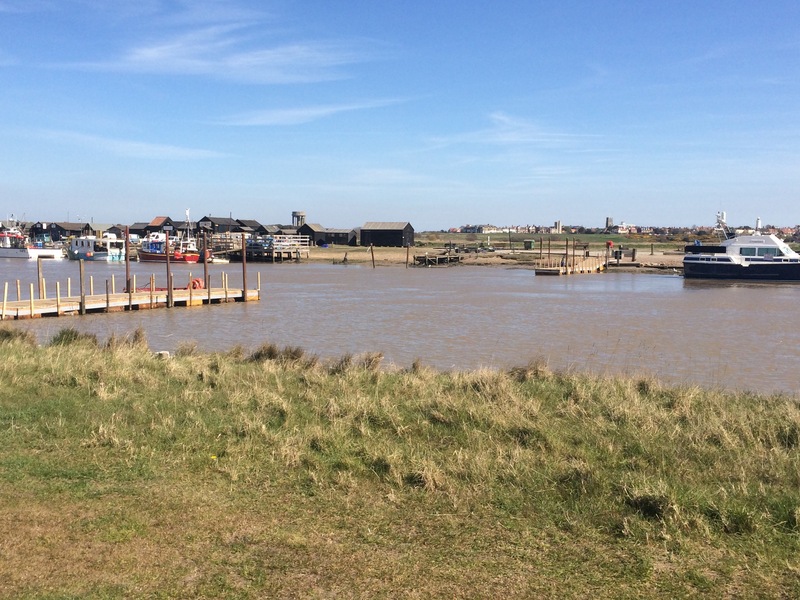 Unfortunately the foot ferry across the River Blyth between Walberswick and Southwold only runs at weekends so I was forced to walk to the Bailey bridge, adding 30 mins. I stopped on Gun Hill in Southwold to admire the view out to sea, where the 1672 Battle of Sole Bay was fought between the English (augmented by the French) and the Dutch; there were no winners. If you ever listen to Blyth 105 FM they have the best radio studio with a cracking view. I stopped for lunch on Southwold Pier – a salad today as I need more vegetables in my diet (followed by coffee and cake!). 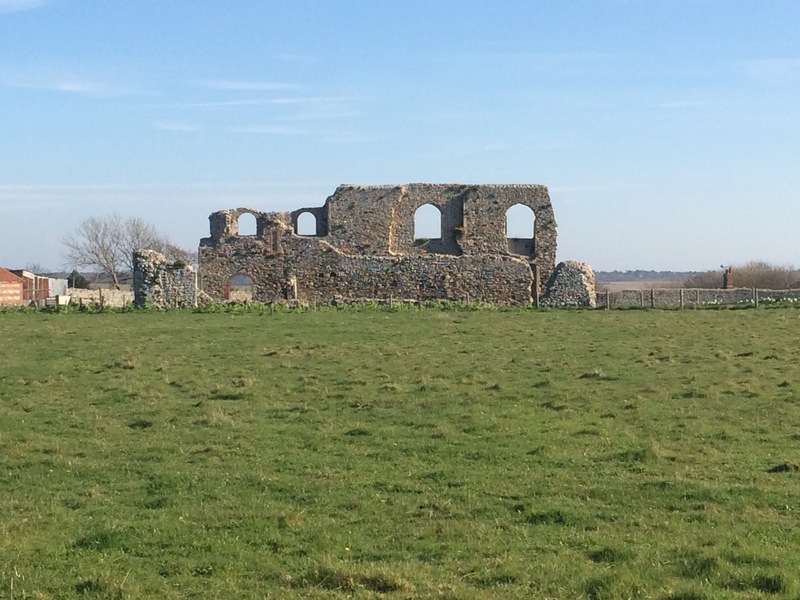 The early afternoon walk to Covehithe was not the best; it was high tide so I had to walk inland and that meant 1.5 miles along a busy road with no footpath, which is the official Suffolk Coast Path. 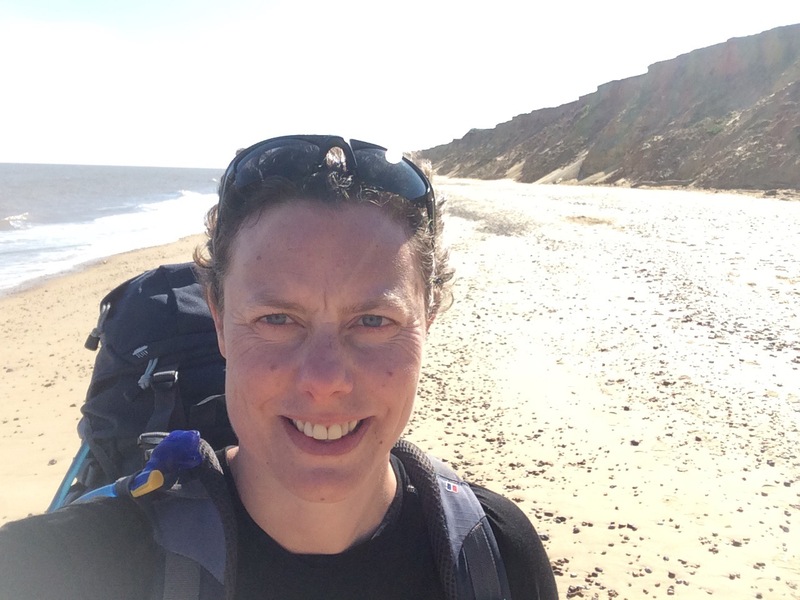 I survived the experience and then from Covehithe the last 3 miles were along the beach in the sunshine. Lovely. The cliff erosion is quite bad in this area and I had a good view of the (small) cliffs. As I wanted to get my tent pitched I didn’t stop for a paddle in the dirty brown sea, but it was calling me. I passed 5 people and 3 asked me about my trip. What a lovely day. It didn’t take long this morning to get to Snape Maltings, which is the start of the Sailor’s Path that runs beside the River Alde to Aldeburgh. It’s a varied 6 miles through heathland, farmland, marshland and seaside, and follows a route once taken by many smugglers. 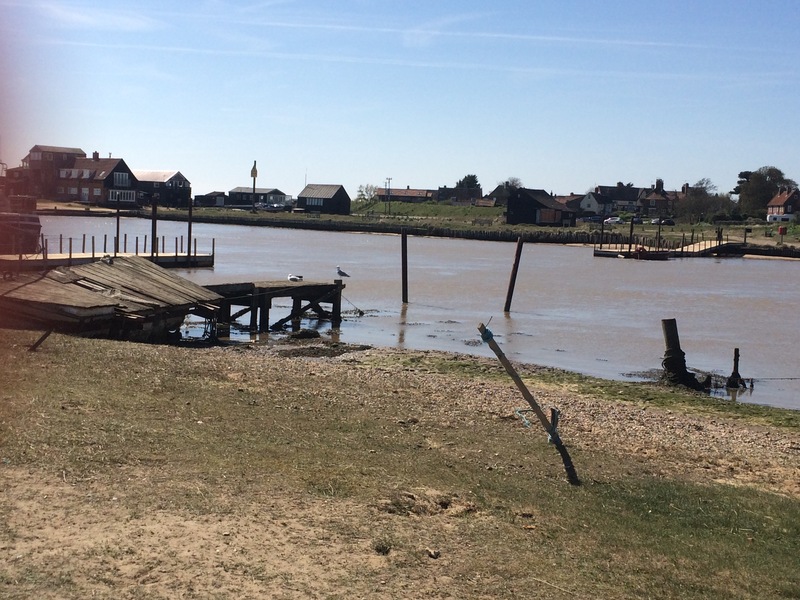 I reached Aldeburgh by 11.30 am and was once more on the seashore. In fact the rest of the day was spent walking right next to the sea and it made a lovely sound. I walked through Thorpeness; once a purpose built holiday village and supposedly where J.M. Barrie wrote most of Peter Pan. It’s a very picturesque place with some nice houses backing onto the shingle beach anyone day I’m going to stay in the House in the Clouds. It was such a hot and sunny day that I decided to stop on the deserted beach and go for a paddle. It won’t be long before it’s a swim! After Thorpeness came Sizewell and a brief stop for a cream tea in the afternoon sunshine. It was one of those days when it was great not to be at work. I passed the campsite where I’ve previously spent a holiday and was disappointed to see the best pitches right by the beach now taken by fake log cabins. I walked past the nuclear power station, where the water’s warmer and the fish glow in the dark, and on to Minsmere RSPB Reserve. I stopped next to a couple with enormous cameras trained on a bush and saw a whitethroat. There were lots of people walking around from hide to hide; the most I’d seen all day outside of Aldeburgh. After Minsmere comes Dunwich Heath, yet another nature area and my last chance to see an adder. The climb up the cliff here does allow for a stunning view back along the coast to Sizewell. All in all a spectacular day. A pity it didn’t finish so well as the campsite tried to charge me £19 for the night (I managed to get it down to £15) because of all their great facilities that I don’t need, and then to top it all off their restaurant is closed on a Monday. I was forced to cook my last portion of cous cous brought from home, which was not delicious but had to do for tonight. Pudding was a chocolate bar.